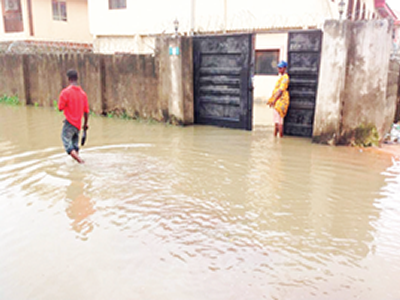 The people living at the Internally Displaced Persons (IDPs) Camps in Ogwuanaocha, Akili Ogidi, Obeagwe and Ogwuikpele, all in Ogbaru have called on federal government’s immediate intervention over flood disaster. Human Rights Defenders of Nigeria led by Dede Uzor reveal this when they visited the IDPs’camps in Ogbaru Local Government Area of Anambra state at the weekend. Speaking while handing over some relief materials brought by the group to the Ogbaru flood committee, Uzor stressed the need for society and men of goodwill to come to the rescue of the ravaged community of displaced persons. The rights activist, who spoke on their desire to provide succour to the displaced persons, urged the Ogbaru flood committee to extend items to the camps in Ogbaru Council Area of Anambra State. Receiving the items, chairman, Ogbaru flood committee, Ben Nwasike, who disclosed that there were over 19, 330 documented displaced persons in Ogbaru were scattered across 11 IDPs’ camps. He noted that of the 11 IDPs’ camps, seven were accessible while four remained inaccessible. Nwasike said: “Our last visit to those inaccessible camps was on 27th September, 2018 and I can tell you that these camps have received relatively nothing. They have not received nets, mattresses, blankets, buckets, food and water due the terrain of their areas. “You can access them with flying boats which can take some hours to reach.